Found one file extension association related to iCloner and 1 file format developed specifically for use with iCloner. Before going on a trip, sending your iPod for repair or simply for safety, keeping backups of your iPod often comes out to be indispensable. How many hours have you spent gathering music, films, pictures, notes, contacts, games and other iPod settings? Losing all these will be like losing your wallet, it takes days to rebuild and plenty of bucks that could be better spent. 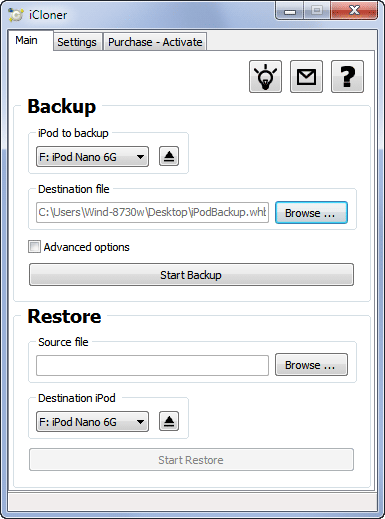 iCloner is your best iPod insurance, as it copies every single file it can find on your iPod and creates easily restorable iPod backup images out of them. If you need more information please contact the developers of iCloner (WindSolutions), or check out their product website.